As Black Friday approaches, I am reminded of the week of FUN we had at the 2013 Holiday Olé Market! It is hard to believe that a month has past (time flies!). This year, throngs of women (and men) from all over the city (and state!) 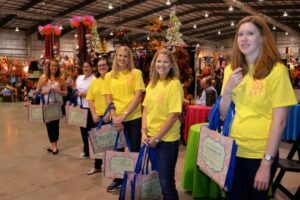 piled into the Exposition Hall at the Freeman for a week of “Shopertainment.” “The 2013 Holiday ‘Ole Market was a HUGE success,” says Erin Alsup, JLSA Holiday Olé committee member. Thank goodness because the success of this event is vital to projects JLSA sponsors in and around San Antonio. “All of the net proceeds from this event allow us to provide much-needed resources for our projects and our non-profit beneficiaries. Without this funding, JLSA cannot go out into the community and make an effective, meaningful impact,” says Shannan Pfeifer, another Holiday Olé Committee member. 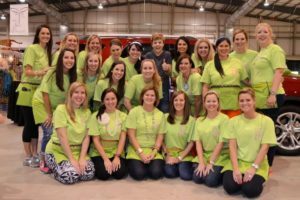 The Junior League of San Antonio has kept the Holiday Olé Market alive since the first market took place in 1990. Just like Shannan mentioned, the money raised from the three day shopping extravaganza helps fund projects all over San Antonio. Another thing the holidays remind me of is our service men and women who so bravely serve in our nations military. The school I teach at recently honored our veterans during a Veterans Day assembly. It gave me goosebumps to see them cheer for each branch of the military and wave their American Flags proudly. Those same goosebumps arise when I learned about the World War II War efforts the Junior League of San Antonio proudly became apart of. Women of the organization dropped everything they were doing and focused their time to serving their country in anyway they could. 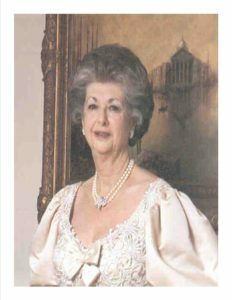 Women like Mrs. Amanda Ochse who was waitressing at the Bright Shawl and decided to become a volunteer at places like the Red Cross, British Relief, and the Aircraft Warning Service. Women like Mrs. Ochse began raising money, organizing food drives, and donating blood. By the end of the war, women of the league had raised over 1,000 canned goods for the United Nations Relief and Rehabilitation and donated $1,500 in care packages for the troops. This is equivalent to $17,404 today! The women did not stop there. They continued their support by establishing a blood bank and nursing organization at Robert B. Green Hospital. They also provided shelter by turning the patio of the Bright Shawl into temporary housing for soldiers stationed at San Antonio Aviation Cadet Center. The very thought of all of this exhausts me and makes me thankful for this organization during a time when we can sit down and reflect on things we are thankful for. I hope you will remember all the leagues efforts- past and present- during this season of giving. Happy Holidays!